It’s that time of year when our body craves deliciously YUM comfort food. My slow cooker runs daily and the oven is always on, cooking something hearty for breakfast or dinner. 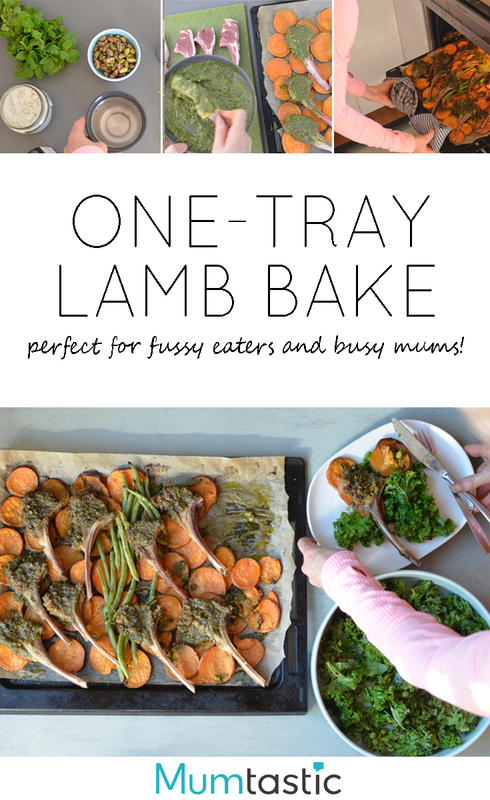 I often pull out this one-tray lamb bake recipe. Why? One, because it’s yum. Two, because it’s all made in the one tray (and this mumma hates washing up). Three, because I can sneak extra veg into my babes. And four, because it’s Y-U-M! Do give it a go and play around with the veggies you add in. If you’ve got potatoes on hand, use them instead. Only have pine nuts? That’s fine-oh-fine. Pop them in instead. 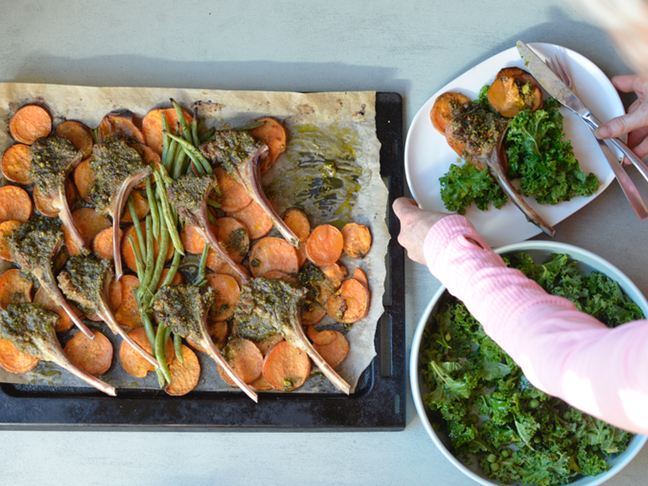 This lamb bake recipe will basically work with any root vegetable – so go for parsnips, fennel, carrots, sweet potato, pumpkin, potatoes, turnips (do kids eat turnips… does anyone eat turnips? ), beetroot, kohlrabi or celeriac. Step 1: Preheat your oven to 230°C and line a large baking tray with grease proof paper. 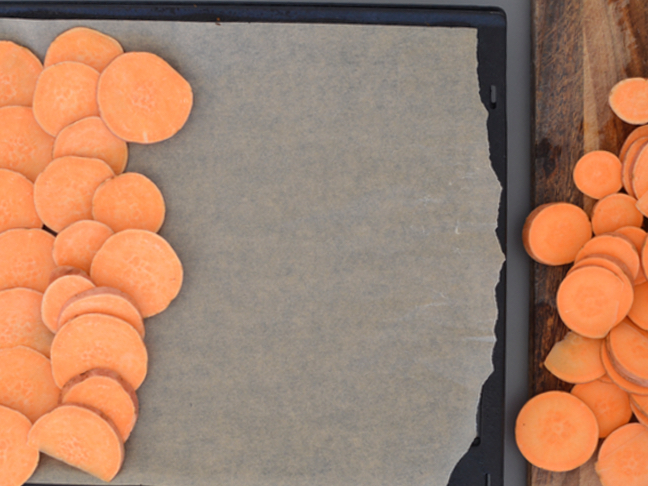 Cut the sweet potatoes into thin rounds and spread them on the oven tray with a drizzle of olive oil. Season with salt and pepper. Pop in the oven to crisp while you make the pesto. Combine all remaining ingredients in a food processor and blend until the pesto is formed. You may need to add a little extra olive oil to bring it together. 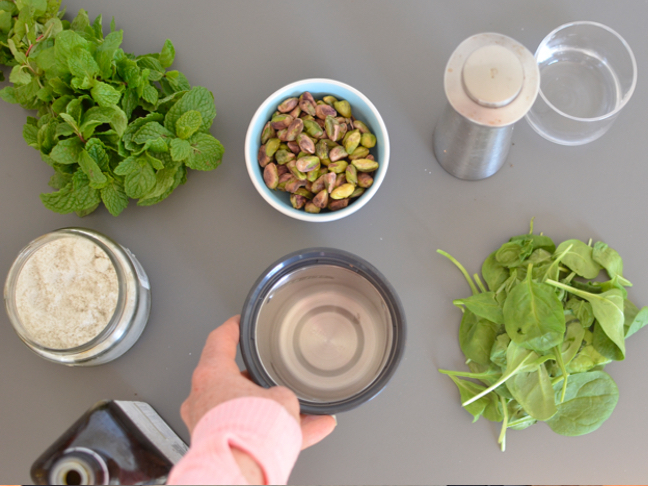 Step 2: Combine all mint pesto ingredients in a food processor and pulse until the pesto is formed. You may need to add a little extra olive oil to bring it together. 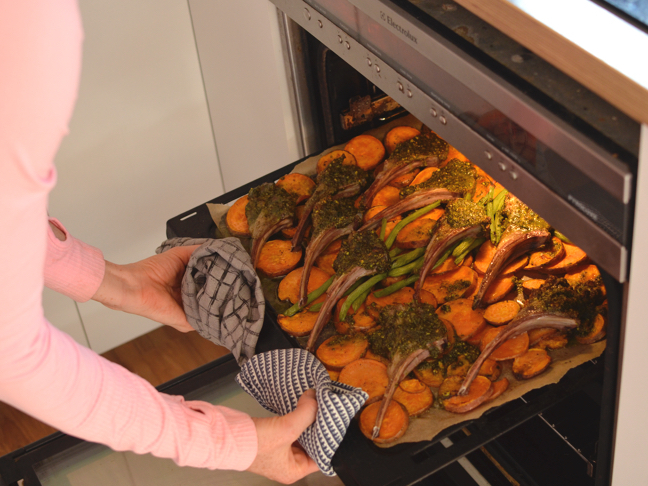 Step 3: Remove the sweet potatoes from the oven and flip them over on the tray. 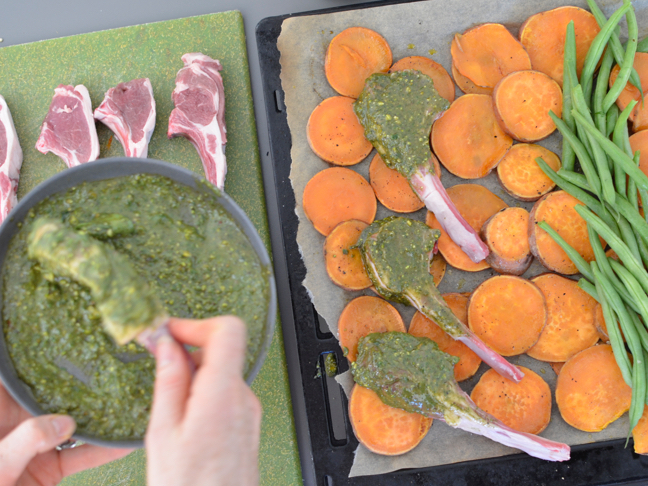 Dip the lamb cutlets into the pesto mix, ensuring they’re really well coated on both sides. 15 minutes or until the lamb is cooked to your liking. 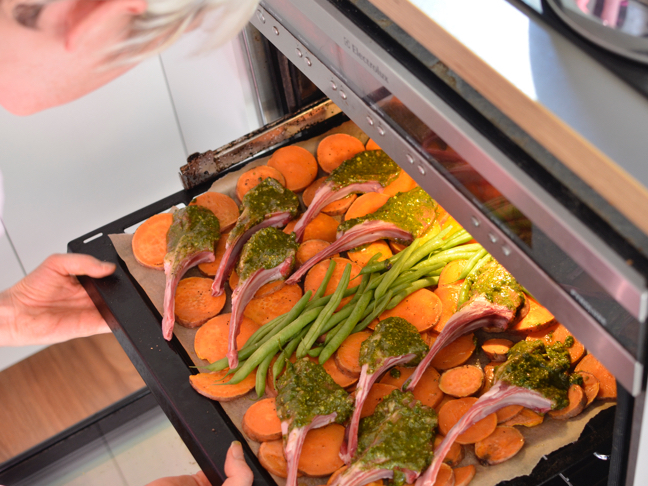 You may want to turn the 'grill function' on your lamb for the last few minutes so the cutlets get a nice crust. Serve with a green salad and any leftover pesto. 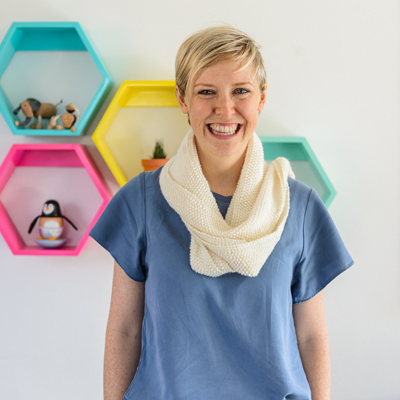 Stacey Clare’s Nutritional Tip: Pesto is a great way to hide extra vegetables in your family meals – keep the colours the same and they’ll never know! Dark leafy greens, especially kale, are packed with calcium and iron which will help keep the whole family in good health.